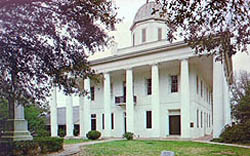 The East Feliciana Parish Courthouse stands as a monument that has suffered few alterations from its original appearance as completed in 1840. Designed by J. S. Savage and built by Lafayette Saunders, the Courthouse stands as a two-story brick building surrounded by a Doric colonnade. Saunders, when his construction bid of $23,000 was accepted, resigned as a member of the East Feliciana Parish Police Jury. The five buildings comprising Lawyers' Row face the Courthouse across Woodville Street on the north side of the public square. 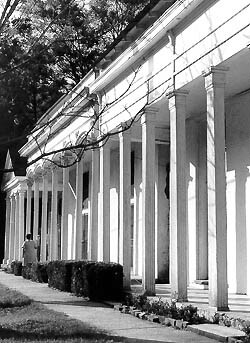 These, like the Courthouse, are Greek Revival in style and painted white. Dating from the 1840s, the two brick offices at the east end of the row and the frame buildings at the west end of the row are alike in having tetrastyle porticos averaging 20 feet in width. The other two buildings each have seven columns under level cornices. A full Greek Revival Courthouse opposite five adjacent law office buildings of harmonious design form an ensemble unique when first completed and even more remarkable for having survived largely intact. Today, only four courthouses built in Louisiana before the Civil War are still used for parish proceedings. Aside from the Clinton, East Feliciana Parish, they are found in Thibodaux, Lafourche Parish, St. Marinsville, St. Martin Parish, and Homer, Claiborne Parish. Some courthouse alterations in recent years to the Clinton Courthouse included cutting vents in chimneys and putting lights on the roof. Original specifications confirm that the East Feliciana Parish Courthouse is minimally altered from its appearance as completed in 1840. The Courthouse and Lawyers' Row, painted in a pristine white surrounding a public courtyard, provide a scenic view of a past that has survived completely intact. Lawyers' Row is located across from the Clinton Courthouse and currently contains offices. Courthouse and Lawyers' Row, a National Historic Landmark, are located in downtown historic Clinton along State Hwy 10. The buildings are open to the public during normal business hours, although tours are not available.